My electronic manual The Mind Killer Defense - A $29.95 value. The Ultimate Memory MP3 Hypnosis Audio Program Using Advanced Hypnosis Technology By Master Hypnotist Kent Sayre. A $19.95 value. Lessons From The “Miracle Doctors” By Jon Barron. This amazing, 177 step by step guide will teach you how to achieve optimum health and find relief from illness. A $14.95 value. How Your Shower May Be Hazardous To Your Health! There is a good chance that this hidden danger is lurking in your shower and you don't even know it. Health Expert Joel Kaye's special report reveals all. A $20.00 value, yours FREE! Instant Download of this entire package (A $114.80 Value) for a one time payment of only $39.95! 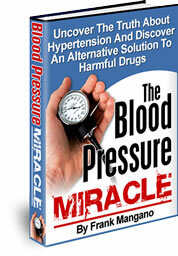 NOTE: The Blood Pressure Miracle , The Mind Killer Defense and Lessons From The Miracle Doctors are downloadable e-books. No physical products will be shipped. After you order, you will get INSTANT ACCESS to download the e-books onto your computer. The e-book format is adobe acrobat PDF, which can be viewed on Mac or PC.